Greenbelt, Maryland. April 9, 2014 – The last piece of the James Webb Space Telescope’s heart was installed inside the world’s largest clean room at NASA’s Goddard Space Flight Center in Greenbelt, Maryland. What looked like a massive black frame covered with wires and aluminum foil, the heart or Integrated Science Instrument Module (ISIM) now contains all four of Webb’s science instruments. Together, these instruments will help unlock the history of our universe, from the first luminous glows after the Big Bang, to the formation of stellar systems capable of supporting life on planets like Earth, to the evolution of our own solar system. 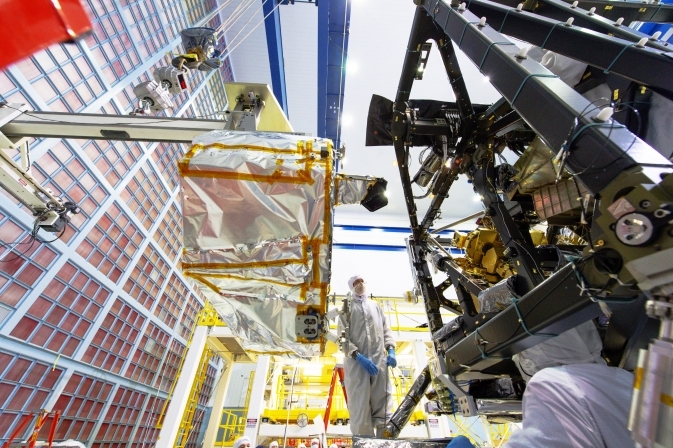 Teams of engineers recently navigated very cramped spaces with delicate materials and finished surgically implanting the last of the four instruments that will fly on the Webb telescope – the Near-Infrared Spectrograph, or NIRSpec. Weighing about as much as an upright piano (about 430 pounds, or 196 kilograms), the NIRSpec was suspended from a moveable counterweight called the Horizontal Integration Tool, or HIT. From below, the engineering team was tasked with painstakingly moving this vital instrument to its final position inside the large black composite frame, officially called the Integrated Science Instrument Module (ISIM). As the team maneuvered this crucial instrument through very tight, hard to reach spaces inside the Webb telescope’s heart, they ensured there was no unintentional contact with the frame because the instrument’s materials are very stiff but brittle. Disturbing any of those materials could have caused major setbacks that could damage NIRSpec. Engineers needed NIRSpec’s six individual feet or legs to align with six designated “saddle” points on the ISIM within the width of a little more than that of a human hair. To hit their marks, these engineers had rehearsed these complicated movements, performing simulations and precise calculations on both sides of the ocean. As they moved the instrument into position they also slowly transferred its weight off of the HIT to bolt it into place. Securing NIRSpec inside the heart was a major mission milestone, and was the first real physical contact between NIRSpec and the ISIM. Teams from ESA, NASA, and Airbus Defence and Space, in Ottobrunn, Germany, have been working on this instrument for more than 10 years. “NIRSpec is a multi-object spectrograph, which means it will be capable of observing 100 objects in the cosmos simultaneously. For each of these objects the captured light will be unraveled into a spectrum,” te Plate said. By sending light from each distant object through an optical device like a prism, NIRSpec reveals the light in all its colors. “Each type of atom or molecule that the object is composed of leaves a unique imprint on its spectrum in the form of spectral lines. These lines are like unique fingerprints for that particular atom or molecule,” said te Plate. From a spectrum, scientists can obtain a wealth of information about a distant object, like its chemical composition, mass, distance, velocity and temperature. NIRSpec was provided by the European Space Agency and built by Airbus Defence and Space in Germany. The Focal Plane Assembly and the crucial Micro Shutter Array, which allows the object selection, were developed by Goddard. This accomplishment comes right after engineers finished installing another essential part of the Webb – the Near Infrared Camera into the center of the heart of the telescope. NIRCam is a unique machine because in addition to being one of the four science instruments on the Webb, it also serves as the wavefront sensor, which means it will provide vital information for shaping the telescope mirrors and aligning its optics so that they can function properly and see into the distant universe. The NIRCam instrument will operate at very cold temperatures, and will be tested to ensure that it will be able to withstand the environment of space. The NIRCam is Webb’s primary imager that will cover the infrared wavelength range 0.6 to 5 microns. It will detect light from the earliest stars and galaxies in the process of formation, the population of stars in nearby galaxies, as well as young stars and exoplanets in the Milky Way. NIRCam is provided by the University of Arizona and Lockheed Martin Advanced Technology Center.